The aluminium wine rack Esigo 6 is a wall-mounted wine rack, a work of art dedicated to wine. The attention that Esigo dedicates to prestigious cutting-edge materials is highly evident in this modern design aluminium wine rack with a steel frame which encloses an ultra-pure aluminium honeycomb design, 1000 drops of hard metal which, by contrast, hide the bottles with the warmth of the wine inside. 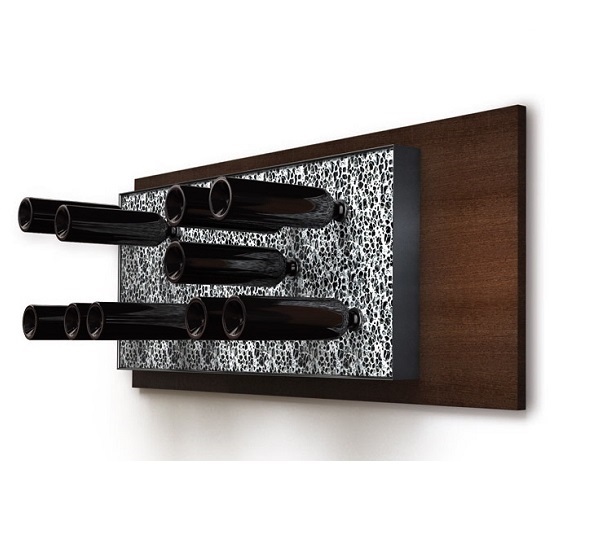 The ruthless and fascinating contrast makes this wall-mounting display unit look like a work of art dedicated to wine. Ideal for displaying in areas where people talk and live wine, in a private environment or when furnishing wine bars, wine shops, wineries tasting rooms and retail shops.